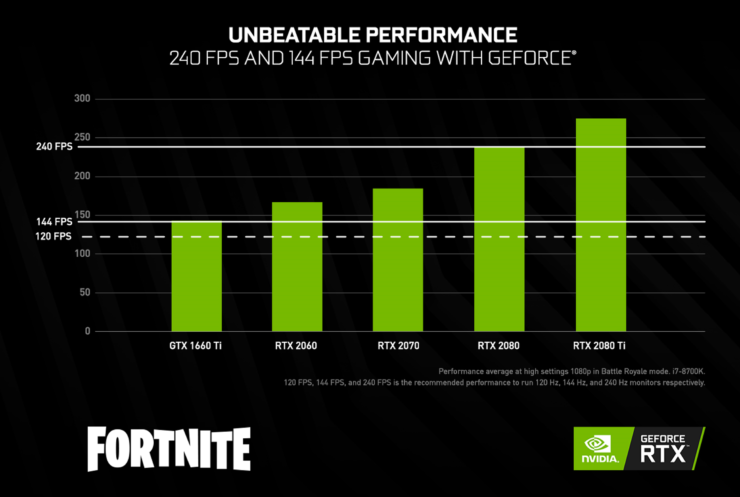 NVIDIA has just published a new blog post detailing the benefits of using GeForce graphics cards to play Battle Royale games at the highest frame rates with lower latency. According to NVIDIA, data was collected using ‘anonymized GeForce Experience Highlights’ on Kill/Death events from PlayerUnknown’s Battlegrounds and Fortnite. This isn’t considered a controlled experiment; it’s rather an observation of what’s happening during live Battle Royale matches. In the first cut of the data, we charted the K/D performance in Fortnite and PUBG of the median player for each GPU generation. 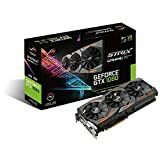 We used the GTX 600-series as a baseline, and calculated the relative increase in kill/death ratio as it corresponds to each successive GPU generation. 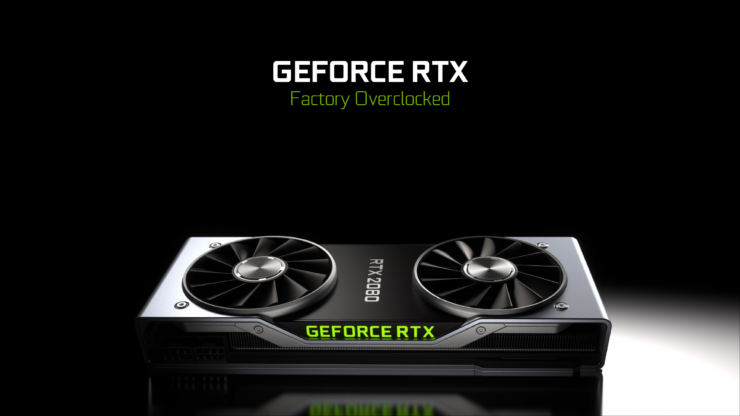 The median player using the new RTX 20-Series graphics cards had a 53% higher K/D ratio compared to a player using the older 600-series cards. 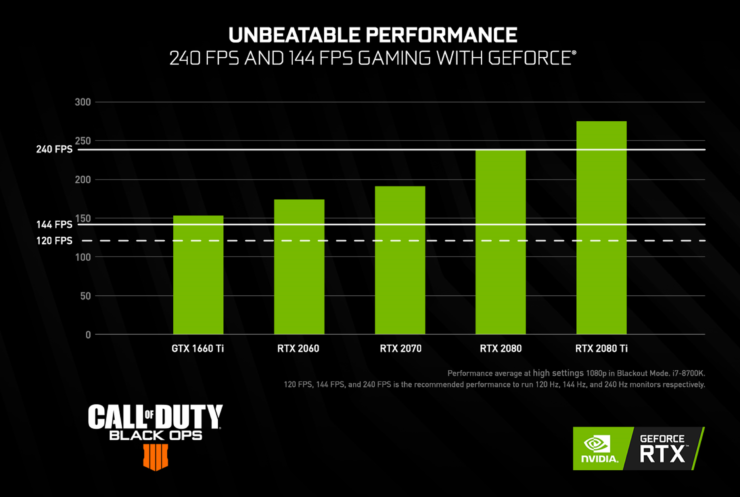 What’s interesting here is that having a better graphics card helped at all levels of play time, whether you only play a few hours a week, or are a Battle Royale veteran. 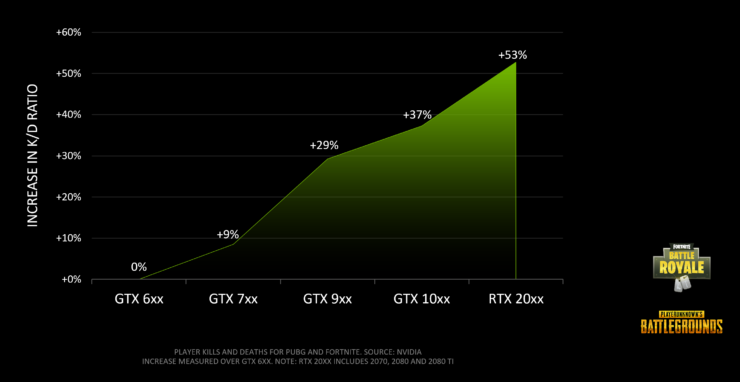 In fact, in the second chart we see that the gap between the GTX 1050/Ti users and the GTX 1080/Ti users expands as hours played/week increase, which means that players with more hours played appear to benefit even more from having a better GPU. This data aligned with what we observed in our lab research — the higher the skill level the more that players are attuned to the game and can benefit from differences in hardware. 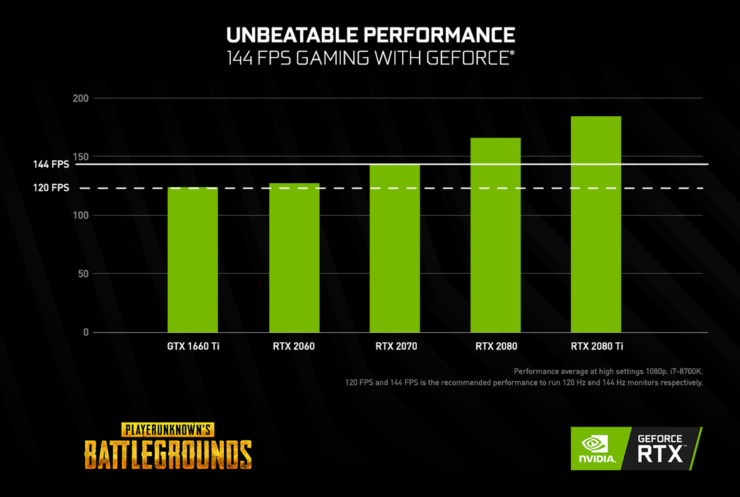 In an additional comparison, NVIDIA looked at how the Kill/Death ratio and GPUs related to the display refresh rate. We compared the difference in K/D for the median player using our GTX 10 Series and RTX 20 Series GPUs with a 60 Hz, 144 Hz and 240 Hz monitor (respectively). Since we were interested in understanding the effect of high frame rates, we limited this sample to players using a resolution of 1080p, as higher resolutions can impact FPS. The data showed that gamers that take full advantage of their graphics card by using a high refresh monitor (144 Hz or above) have significantly higher K/D ratios. And as we’ve seen before, that performance increases significantly as you work your way up to the RTX 20 Series GPUs. Lastly, NVIDIA shared graphics cards recommendations depending on the Battle Royale games and frame rate target. Apex Legends has taken the Battle Royale scene by storm, reaching 25 million players in its first week. With most players trying to learn the game as fast as possible, having the right gear can help you get there faster. 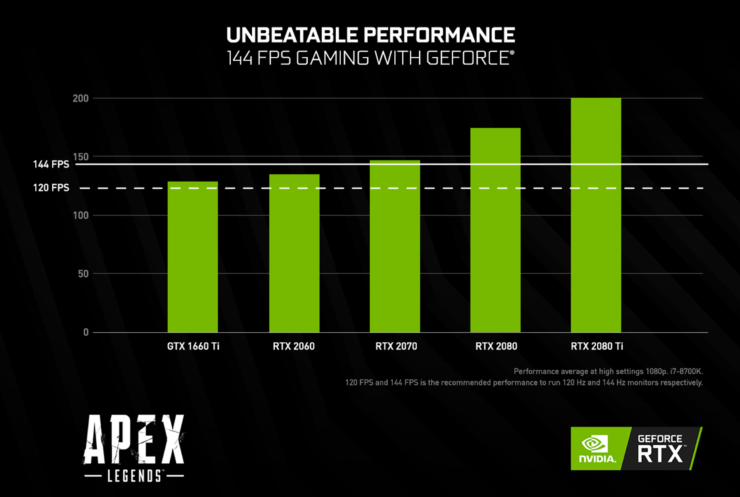 With the new RTX 2070, you will play at 144 FPS at High settings, and the RTX 2080 Ti will put you up at 200 FPS. 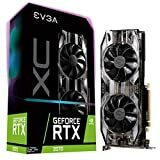 Now you can always lower settings further to push higher FPS, but with RTX GPUs you can get both competitive FPS and maintain good graphics quality. This is particularly important for players who livestream, or capture and share their gameplay. To be honest, this seems quite straightforward and comes as no real surprise. 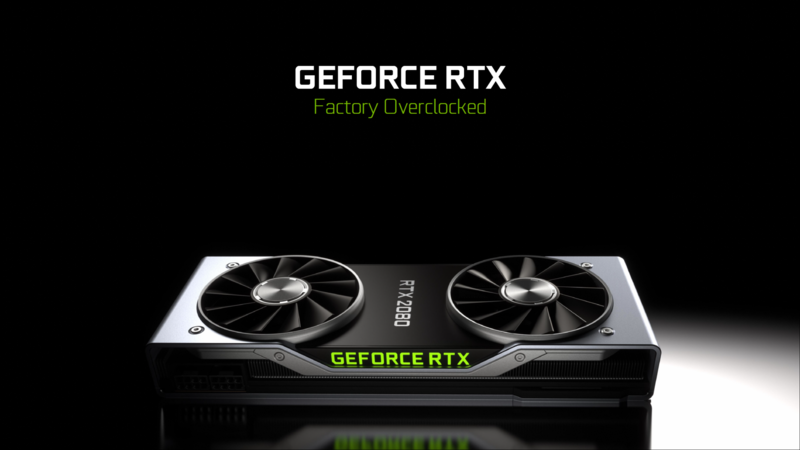 The high-end GeForce RTX graphics cards in particular are the top performers on the market right now and it’s only natural they’d be able to yield the highest frame rates possible while keeping decent graphics settings. Similarly, professional gamers will want to use displays with 144 Hz or higher refresh rate.